Dearly beloved, we are gathered in a field in the dimpsy glow of summer’s dying days to see joined in matrimony this man and this woman… who hasn’t yet arrived. Peter, the village priest, and his three nuns keep us entertained while we wait, but as the hour grows late our safety cannot be guaranteed. 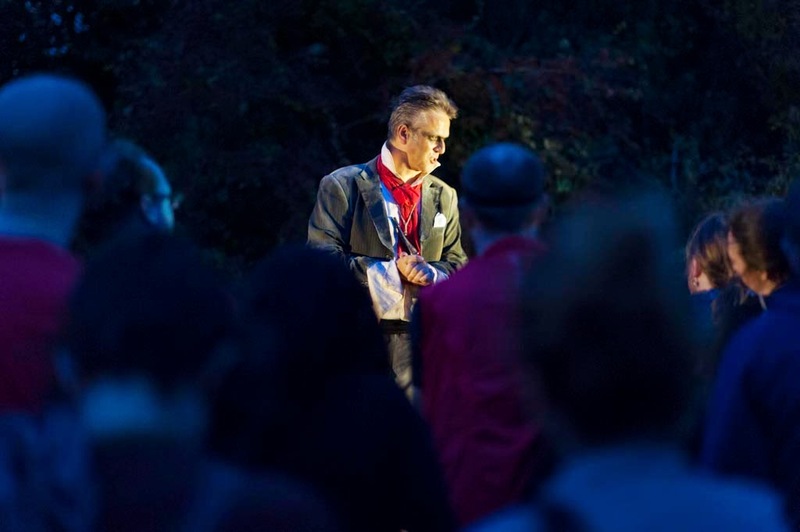 The Duke bursts in to tell us that the bride has been spotted heading for the hills, as has the Wolf, and we – split into two groups, runners and walkers – must join Red Riding Hood and the Huntsman as they set off in pursuit. But who is chasing whom, and for what reason? ‘And remember to stick to the paths,’ Peter advises, for these are dark times, and when night falls, the wolves begin to circle. Pulling in themes, narratives and characters from several stories in The Bloody Chamber, Angela Carter’s collection of feminist reworkings of classic fairy tales, Burn the Curtain’s new promenade production is an exhilarating romp through nature (for the runners at least) that captures the essence of Carter’s darkly alluring original while creating something satisfyingly new. And although it doesn’t always deliver on the theatrical component, it is hugely enjoyable. Covering a five-mile route, the runners are ‘hunters’, tasked with tracking down the wolf; following a two-mile circuit, the walkers are ‘gatherers’, dispatched in pursuit of the missing bride. Over 2.5 hours, we make our way through woods and across fields, plunging into valleys and cresting hills, each group experiencing the narrative independently, encountering characters and scenes at different stages but coming together at key points to witness something in unison or to discuss what each has learned before moving on. 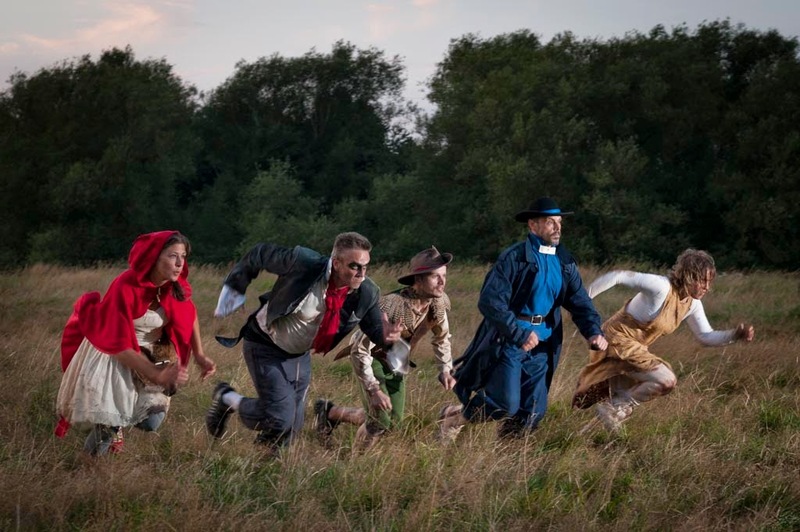 Running alongside us, the characters offer snippets of detail, and we ask them, and each other, questions to tease out the plot, gradually discovering what the Duke (Richard Feltham in arch pantomime villain mode) gets up to at night, the truth about semi-feral Alice (Rebecca Savory), and the extent of Red Riding Hood’s vulpine passions. It’s fun and participatory, and the interactions never feel forced, and I’d forgotten just how stimulating it is to the creative imagination to be running around outdoors. But the bigger scenes, the ones in which we are supposed to get a proper hold of the narrative, are less successful theatrically. After pelting full throttle up the side of a field, I wanted more from a visit to Grandma’s house than simple exposition about what the Huntsman (Alexander Warn) has seen through the window. And while it reveals why Red Riding Hood (aka Ruby, a gloriously feisty Becky Baker in blood-red cape) is quite so keen to get to the Wolf before anyone else (‘he’s a puppy with me,’ she says), and allows for a confrontation that sets up the next scene, it doesn’t feel rewarding enough after all the effort to get there, and falls rather flat alongside the elemental aspects of the run – the encroaching darkness and deepening shadows, the crow-calls across the sky. The company are clearly skilled at people- and location-management, and the environmental interactions are very effective – especially nice is hearing Grandmother’s voice filtering through the trees as we scamper past; characters appear form around blind corners to offer information and advice; they appear in the distance, beckoning us to follow this path or that. They do well to keep the Wolf, when he finally appears, at a distance; it’s more effective to let the imagination fill in the blanks. At the time – and more so in retrospect – I’d have liked more sound effects as we ran through the trees (incidental music et al is provided by a large speaker and associated kit pulled along on a parcel trolley by one of the production team, who out of necessity sticks with the walkers). Although, having said that, once full darkness had fallen and we were running through green lanes lit only by the frantic bobbing of our headtorches, it’s doubtful that my heart could have coped with actual howling coming from the impenetrable surroundings. Despite the somewhat fractured nature of the whole – and a twinge of the dreaded Fear of Missing Out – it becomes less important when the general joyousness of being out in the open takes over. It’s as if the narrative is suspended around us rather than being pressed upon us in a traditional sense, and while there might not be quite enough to grab on to, what is there we grab with both hands. While this adaptation has dispensed with the sexual undertones of the original stories and Neil Jordan’s film, what is still at the forefront is Ruby’s warrior spirit, her feminine strength and empathy for the wolf – and it’s this combination that makes her ‘nobody’s meat’. And boy is it empowering and invigorating to run through nature in the dark, sucking in great lungfuls of fresh, dusky air; panting like dogs, ankle-deep in damp grass and cow-pats. It’s a reminder of the allure of the werewolf myth: the strength and physicality, the presence in the moment – always more appealing to me than vampires, who skulk about looking pasty, cursed with immortality. At one point I’m running up a hill so steep I fear I might tip over backwards, but once at the top, the view is breathtaking, the lights of the city twinkling below us. ‘There’s our village,’ says the Duke. ‘Home.’ And we all stare silently for a moment, perhaps contemplating what that means. If the theatrical element is missing in some episodes, the finale more than makes up for it, bringing in aspects of pagan ritual, mystery and magic, and revealing just how astute and skilled the cast are at managing the audience, leading to a denouement that is thrilling, scary and – if I’m honest – completely envy-inducing. At the end of a journey that has demanded many choices – which path to take, which characters to trust – we’ve got one last decision to make. By then, hearts pumping from the chase, the pulsing night around us illuminated by torches, there really is only one way to go. And I defy anyone not to finish with a joyous howl at the moon. 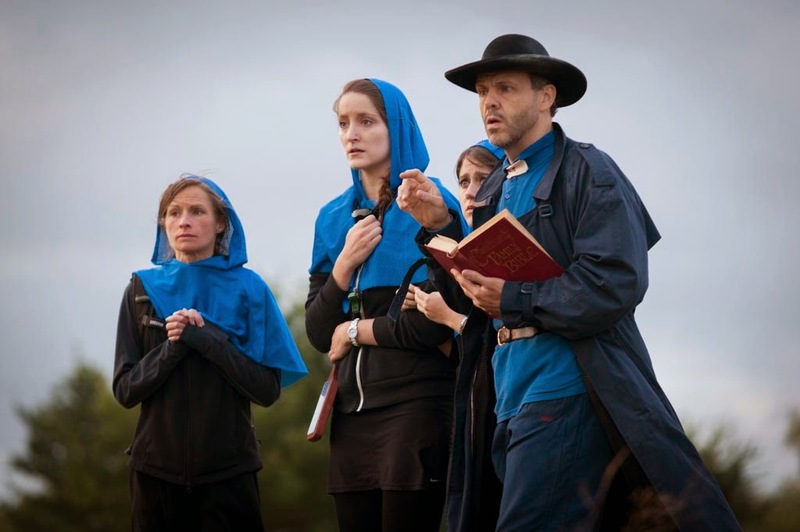 The Company of Wolves will be reprised at Sharpham Estate, near Totnes, on 30th & 31st October – I can't think of a better way to spend Hallowe'en!